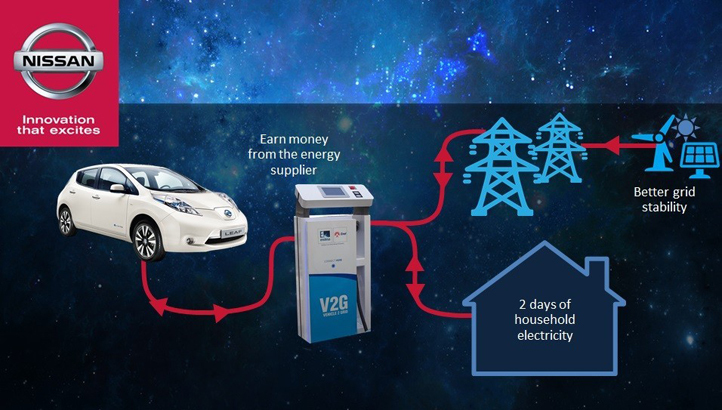 The world's bestselling electric car manufacturer Nissan has teamed up with energy powerhouse Enel to revolutionise the EV market by allowing drivers to act as 'energy hubs' with the ability to store and send back excess electricity to the grid. Trials have begun in Denmark using Nissan LEAFs to develop a ‘Vehicle 2 Grid’ system that aims to integrate EV owners and fleets into the grid by charging the cars at low-demand times with cheap tariff periods. Energy generated during these periods can then be stored at home or fed back into the grid to generate greater returns. Paul Willcox, Nissan Europe Chairman commented: “Nissan is the world leader in electric vehicles. We've being doing it longer than anyone else, we've sold more than anyone else and we've got plans for the future that are more credible than anyone else. If the trials in Denmark are deemed successful, deployment will branch out to Germany, Netherlands and other areas of Northern Europe. Using France as an example Nissan explained that the current 130GW capacity for the 38 million strong EV sector could triple to 380GW of capacity if the Vehicle 2 Grid system was implemented. The partnership with Enel also envisages enhanced batteries and charging station for electric taxi cooperatives. A similar idea was mooted by scientists back in September, using underground wire coils to wirelessly transfer the energy. The prospect of futuristic fuel station has also taken a step closer to reality with Nissan revealing a new teaser video for the ‘Fuel Station of the Future’ concept in collaboration with architects Foster + Partners. Nissan announced the partnership with Foster + Partners to create the Future Fuel Station back in August. The two announcements strengthen Nissan’s ideologies of the future of EVs which has seen the company unveil concepts for what it calls 'the future of autonomous driving and zero emissions'.